Cut Glove I make sure the kids are always wearing one of these when using the knife. Pampered Chef Chopper (Amazon Prime) This is actually cheaper direct from Pampered Chef. If using frozen or raw chicken, see pre-cooking instructions below. Pour chicken broth, salsa, diced tomatoes w/green chiles, and black beans into pot to begin heating. Stir in cumin and salt (if using). Dice bell pepper, onion, and garlic while liquids are heating in the Instant Pot. Add peppers, onions, and garlic to pot. Stir in cooked, shredded chicken. 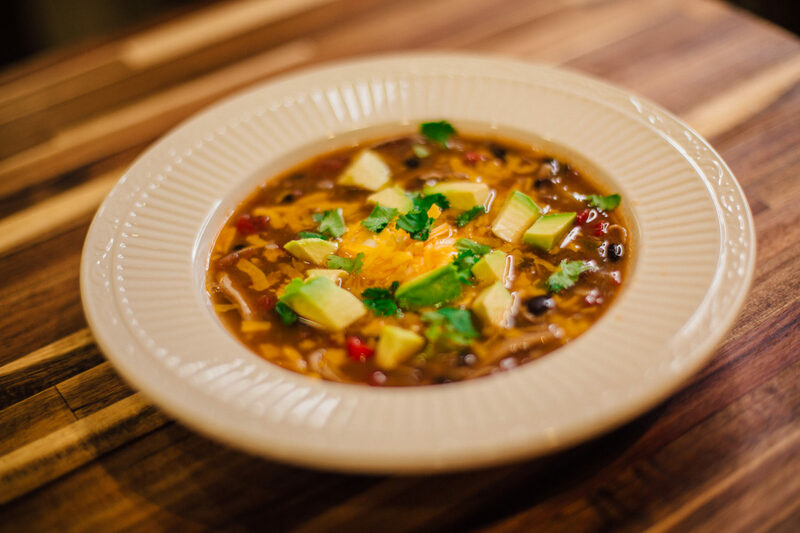 Drop pieces of corn tortilla into soup and stir well. Set your Instant Pot to <Pressure Cook> or <Manual> mode for 6 minutes at High pressure. Natural release for 5 minutes, then quick release the rest. If you’re not yet sure how to do all of that, no worries. Read the next set of instructions. Serve and enjoy! If desired, top with sour cream, shredded cheddar cheese, cilantro, avocado, and tortilla chips. Press <Cancel> on Instant Pot to cancel the Sauté function that is heating soup. Press <Pressure Cook> or <Manual>. Press <+> or <-> to change time to 6 minutes. Pause and wait 10 seconds for Instant Pot to beep. Now the pot will heat soup to a boil and begin to build up pressure—about 10 minutes, if it was fairly hot when the lid was closed. When pressure is reached, the silver float valve on top of lid will pop up. In 1-2 minutes, the display on the front will show 6 minutes and then begin counting down. When it has counted down to zero, it will beep. Display on front will begin counting up. Wait five minutes—5 min Natural Release. Carefully turn valve to Venting, while keeping hands and face away from hot steam. Steam will begin pouring out the top, much like a steam locomotive. When float valve drops, the lid can be opened. Soup is very hot. To Pre-cook raw or frozen raw chicken: Place frozen or raw chicken in Instant Pot. Season with salt, pepper, garlic powder, and onion powder. Add at least 1 cup of liquid to the pot. Press <Pressure Cook> or <Manual>, set for 8-10 minutes at LOW pressure for chicken breasts or 10-15 min at HIGH pressure for chicken thighs. Natural release for 3 minutes, then quick release the remaining pressure. Proceed with recipe as directed above. Tear up corn tortillas and place them in pot. Help sort and rinse dried beans for pre-cooking. This is a great sensory activity for pre-schoolers! Carry cans of tomatoes from the pantry to the kitchen. This activity helps them learn ingredients and where they are stored in your home. Watch you open cans of tomatoes and beans. Talk about being safe with sharp edges. Carry onions and wash bell peppers. Chop garlic with a chopper. Core bell peppers after you slice in half. Dice bell pepper strips with a paring knife or steak knife. Put on a pot of beans with supervision. Put on a pot of bone broth with supervision. Pick chicken meat off a rotisserie chicken. Drain and rinse cooked beans. Pour in canned tomatoes, salsa, cooked beans, broth. Make or add items grocery list. Use Instant Pot to make entire meal. Plan a theme night for Cinco de Mayo or Tex-Mex Fun night. If you have any questions, ask us below, or on our Facebook page! 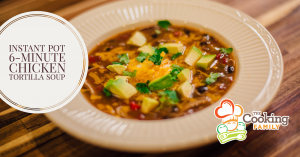 We hope you enjoy making and eating this delicious soup with your family! 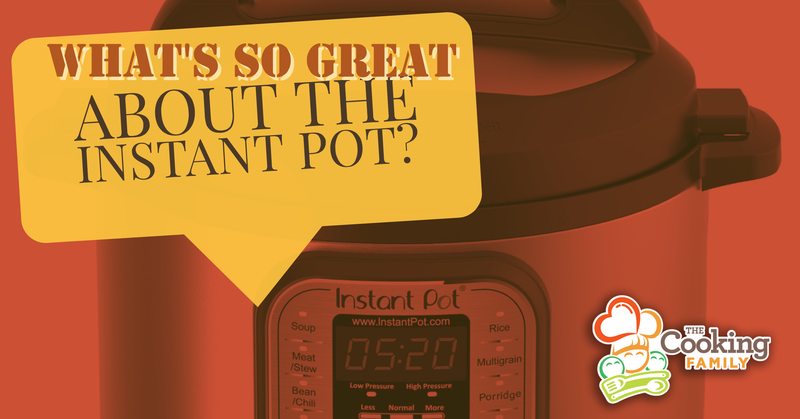 Previous Post: « What’s So Great About the Instant Pot? Hey Holly, I love what your family is doing. You are an amazing momma! I got the Instant Pot in January and I’m enjoying it but ALWAYS looking for new recipes! Thank you for doing this! Hope you guys are all doing well. I got to say hello to Phil last week at Jyra, but I haven’t seen you in forever. I miss your sweet face!! So do you just add the cooked chicken at the end, right before serving? I can’t see that part in the instructions. Thank you! I usually add the chicken before cooking the whole soup. I added a step 6, because I left that out of the instructions before. Thanks for that catch! Thanks so much for the report, and for sharing with your friends! This has been the most awesome cooking video I’ve seen! I thoroughly enjoyed seeing this family work together!! Each one did a fantastic job.